Note: A comment of Professor Leonard Rosenthal was published on the Financial Times website after distribution of the article to Forum participants, and has been added to the presentation below. 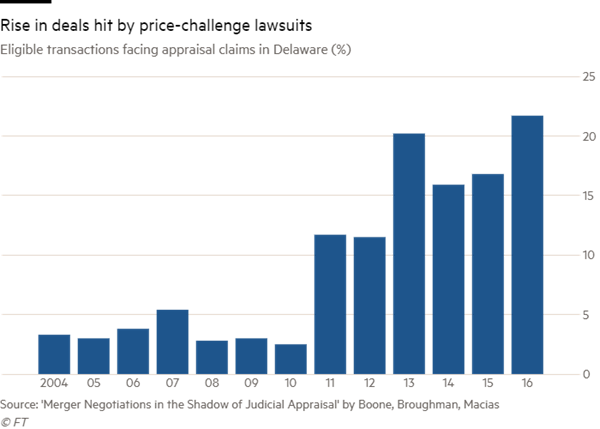 A recent court ruling involving the $24bn buyout of Dell could mean “game over” for hedge funds that have profited from asking US judges to boost the prices of takeovers after they have closed. Hedge funds such as Merion Capital and Magnetar have raised a total of more than $1bn from investors in recent years to fund lawsuits in which they challenge the fairness of the price paid to acquire public companies. These “appraisal” cases seek to profit by convincing judges in Delaware, where most US companies are incorporated, to give them a higher payout. The funds initially scored a series of high-profile wins, pushing up the buyout prices paid to dissenting shareholders in deals involving Dell, Dole Foods and Cox Radio among others. But earlier this month, the Delaware Supreme Court threw out an award stemming from the 2013 acquisition of Dell, and ruled that the deal price should prevail when a sale process is demonstrated to have been competitive. However, other investors predicted the strategy would survive as long as hedge funds became more selective about picking their targets. Up to now, the strategy has proved very popular and lucrative. In 2016, one out of five eligible deals faced a hedge fund lawsuit seeking a higher “fair value” price, up from less than one in 20 a decade earlier. While the hedge funds tended to win only small awards in most of their cases — in the Dell matter, Silver Lake and Michael Dell owed hedge funds led by Magnetar Capital roughly $20m — in some appraisal cases, judges have granted awards in excess of twice the deal price. One recent study pegged the annualised returns of appraisal funds at 33 per cent. Such success also spawned bigger bets, notably Merion Capital — created by shareholder attorney Andrew Barroway — took a $600m stake in the grocer Safeway during the buyout by rival Albertsons. The investment represented about 10 per cent of the total deal price. People familiar with that matter said that Blackstone’s hedge fund unit had invested $200m in Merion’s $1bn+ fund. Companies targeted by the appraisal hedge funds pejoratively labelled their strategy “appraisal arbitrage”. They pointed out that Merion and some of the others typically acquired their shares in target companies after a transaction had been announced with an express plan to challenge the price in court. The prevalence of the strategy also spooked some potential buyers. By early 2016, bankers and lawyers were noting that merger contracts were increasingly including “appraisal out” clauses that gave purchasers the option to escape a deal if too many shareholders challenged the price. But the tide started to turn this year. Judges in both the Delaware Court of Chancery and the Supreme Court ruled against the appraisal funds in several cases, finding that the merger price or even a lower price constituted fair value in the acquisitions of such companies as Clearwire, Petsmart and DFC Global. 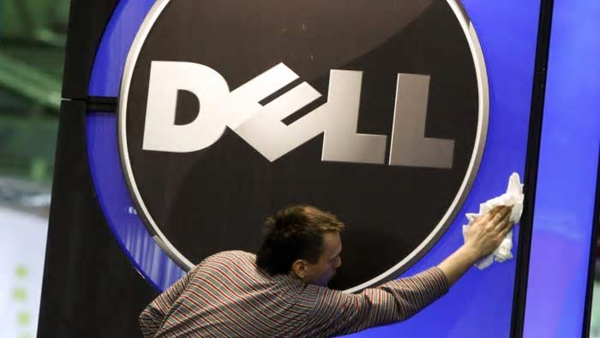 Now the Dell ruling has given buyers very clear guidance on how to avoid being second guessed on the deal price in the future, company advisers say. In that case, Delaware vice-chancellor Travis Laster had used his own models to determine that Dell’s fair value per share was $17.62 rather than the $13.75 that Silver Lake Partners and Michael Dell had paid. He ordered the buyers to pay the difference. But Delaware high court said earlier this month that Mr Laster had inappropriately dismissed the extensive sales process that Dell had undertaken. “The recent Dell and DFC decisions indicate that it will be difficult for hedge funds to do better than market price where a deal had a strong sale process,” says Adam Gold, an attorney at Ross Aronstam & Moritz, a Delaware law firm that represents companies. Appraisal investors and lawyers who work with them agree that the ground has shifted. Some of them complain that the Delaware judges have now become too deferential to companies and too willing to accept deal purchase prices. “If Delaware wants to gut appraisal to be the most corporate-friendly jurisdiction in the world, that will have consequences which include fewer shareholder protections and lower valuations”, says Geoffrey Stern, who won an appraisal award connected to DFC Global, only to have it overturned by the Supreme Court. But other investors who follow this strategy say they believe it can still survive. Matthew Giffuni, a longtime appraisal investor at Quadre Investments, says the cases that have made it to court tend to be the weaker ones because companies are quick to settle the most compelling cases of undervaluation. The reporter left out something very important that the court cited in their ruling. That is, the presumption that markets are efficient should be taken as a given. The importance of this is cited several times in the decision. Unfortunately, the Delaware Court needs to catch up with the finance profession. Indeed, the Nobel (pardon the incorrect use of words) committee in economics has come to realize that there is no monolithic view on efficient markets. As is well known, in 2013, there were two awards - one to the most ardent believer in efficient markets (Fama) and the other to someone who believes that efficient markets must be leavened with the understanding that human behavior plays an important role in markets (Shiller). In 2017, the most ardent proponent of the role of human behavior in economics and finance (Thaler) with its impact on markets as well gets a Nobel in economics. (It should be noted that even Thaler is not an absolutist and does not say markets are completely inefficient. He thinks that human behavior must be understood as having an important important role in economics and finance. This writer thinks that the Delaware Court can improve its decision making with regard to appraisal if it better understands that an absolutist view of efficient markets is no longer accepted as an explanation of how markets operate. For the record, this writer is a long time finance professor who teaches EMH as part of undergrad and grad investment finance courses.